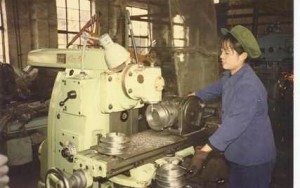 Factory worker in China, 1986. When Mike Genung first visited China in 1986, most of the Chinese people – men and women alike – wore blue or gray Mao suits. There were no Western chain hotels. At a stay in one of the local hotels, Mike owner discovered that hot water was available one hour a day. China manufacturer quality and factory working environments in China reflected a country that was still rising from the ashes of the oppressive Mao era. Old machinery and equipment, rugged working conditions, unreliable communication, and constant shipment delays were the norm. The industrial base was small as were the product offerings. Today, China boasts one of the world’s largest industrial bases; products of every kind are available. Apple’s Ipod, Dell’s Computers, Nike’s footwear, and many other products are made in China. What isn’t being made now, can be developed. Many manufacturing companies boast late model, computer run U.S. or European made equipment. Communication services are up to date with the rest of the world, and delivery times are many times better than that of the manufacturing companies of 1986. Overall improvements in China manufacturer quality have been enormous. 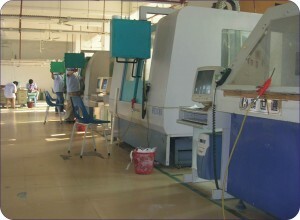 A factory in China today, with CNC (computer controlled) lathes. Our partner trading companies in China provide immediate access to thousands of reliable China manufacturers; we work with most products made from metal, plastic, wood, stone, ceramic, glass, nylon or leather. We can source existing products for you from a China manufacturer who is making the same product now, or get custom products made to your specification. We need either a print or sample of the part to proceed with a factory search; from there, our people in China will conduct a search for the right China manufacturer. View products we source. China manufacturer quality is as important to us as it is to you. We work only with suppliers who back up the quality of their work. Although we take steps to prevent problems, product that is made outside of your written specifications, provided prior to the start of production, will be replaced or credited.